I’m headed to Mexico for My Artist Residency! I am honored and delighted to be the Artist in Residence at La Huipilista Artspace in beautiful San Miguel de Allende, Mexico. I fell in love with the region in 2011, while visiting this magical colonial village after making my first pilgrimage to the Shrine of the Virgin of Guadalupe. The importance of the pilgrimage was seeded early in my childhood as I grew up knowing that my birthday was held under the mantle of this most important feast day. It is truly a dream come true for me as an artist to be living, working and exhibiting here, as Artist In Residence, in this place where beauty, color and inspiration abound! A collaborative installation is also included, “Love Letters to the Children and Families.” You, our visitors, will be invited to share your thoughts and prayers for those currently impacted by the U.S. administration’s border separation policy. Please join us at the opening reception Friday, October 12th from 5-7pm at La Huipilista Artspace. The exhibition will run through November 3rd. Champagne Art Salon this weekend, 9/17/16 ~ 5:00-8:00-p.m. Looking for something fun and *different* to do on Oahu this weekend? Then welcome, and join us for an elegant evening of art, music and champagne! Get inspired to create a life where you feel healthy, happy and whole. Join singer and songwriter Lucie Lynch and me for a European style Art Salon and Full Moon private concert, featuring my art and Lucie’s music! Mingle with us and our guests at my home and studio, with stunning views of Koko Head and lose yourself in the endless blue of the vast Pacific Ocean. With a glass of champagne in your hand and a variety of delicious pupus to choose from, peruse the art and enjoy an opportunity to really engage with it, up close. Feel free to ask questions and invite conversations. This will be an interactive experience, harkening back to the Gertrude Stein Art Salons in Paris in the early 1900’s. At 7:00pm, we’ll gather for an exclusive private *Full Moon* concert with Lucie, as she weaves my art into her music, and makes the paintings come alive! As you ease into this threshold time of a brand new year ahead, we invite you to take some time to dream, meditate, spend time in nature or just begin browsing through magazines, old calendars, maps & books. When you feel an intuitive connection to an image, word or phrase, just tear it out & begin your “Vision Board Folder.” Don’t worry about ‘why’ you’re drawn to something, just trust that there’s a reason for it. Stay out of your head & instead, remain in an open & curious heart space. As we begin to assemble our Vision Boards on the day of the event, connections will begin to form & puzzle pieces will perhaps(??) begin to make sense. This process is about tuning inwards & listening to your soul’s longings & desires. If you don’t have time to do this ahead of the workshop, that’s fine too. 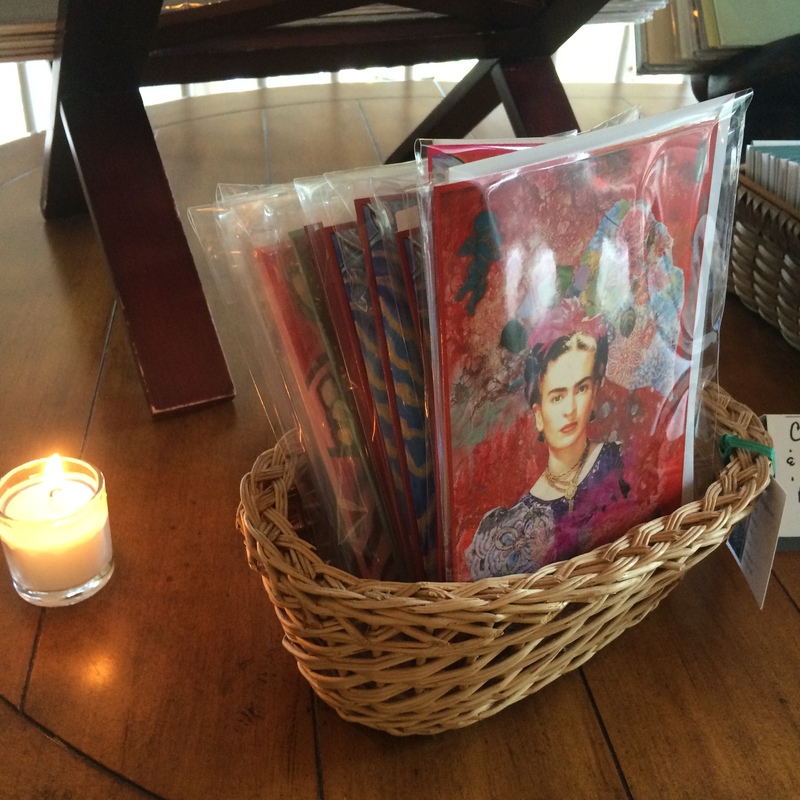 So, yes, please join us at Glitter Gypsy Studio for this magical Vision Board workshop! Just show up; we’ll take care of the rest. You’ll begin your day being nourished & nurtured by enjoying a gourmet, healthy & scrumptious feast (vegetarian, vegan, gluten & dairy-free options available.) 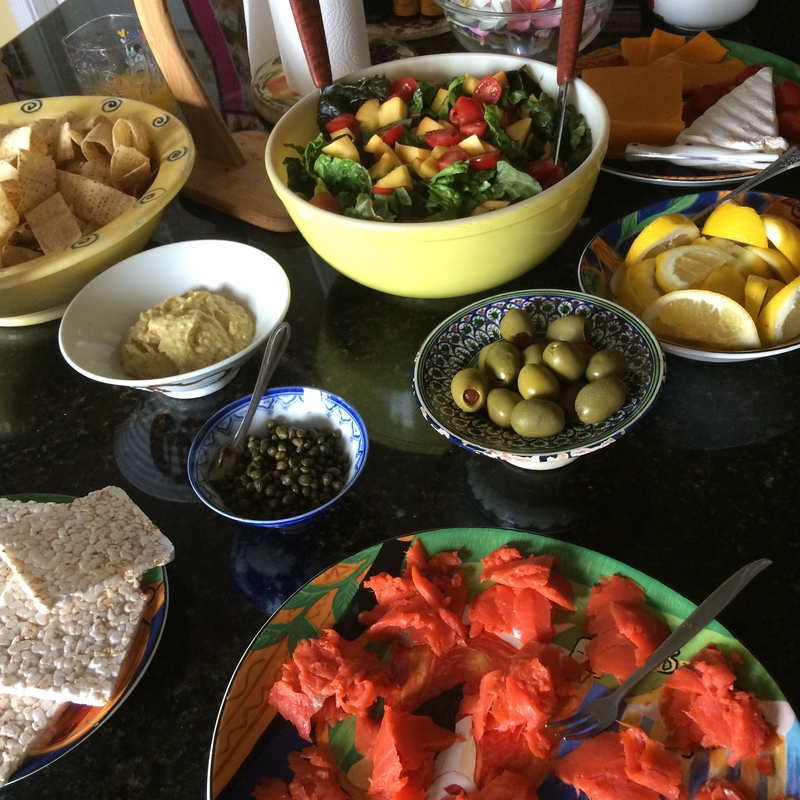 Think delicious salads, fresh herbs, local tropical fruits & fresh seafood, if desired–yum! 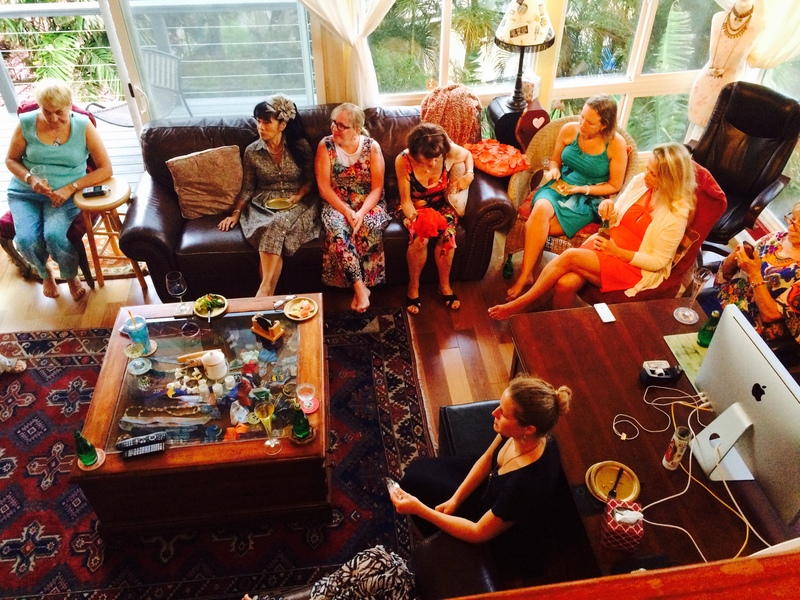 We’ll then go into a women’s visioning circle to get grounded & connected. Next, the creation of YOUR vision board! No art experience necessary & all materials & instructions provided. Find your “spot” to work- on our ocean-view & Koko Head facing lanais, in the courtyard around the swimming pool, on a cozy chair or cushion, wherever you feel comfortable! Do your own thing, or feel free to ask for guidance. As a special BONUS TREAT, singer/songwriter LUCIE LYNCH will be inspiring us with her angelic voice & beautiful songs! Delicious & nutritious chocolate shakes will be served when you need a little boost mid-afternoon–mmmm… At 4:00, we’ll gather for our closing circle & sharing–breakthroughs, insights, discoveries. Your hosts: Susan Conrad Risse, Visionary Artist, Teacher & Guide. 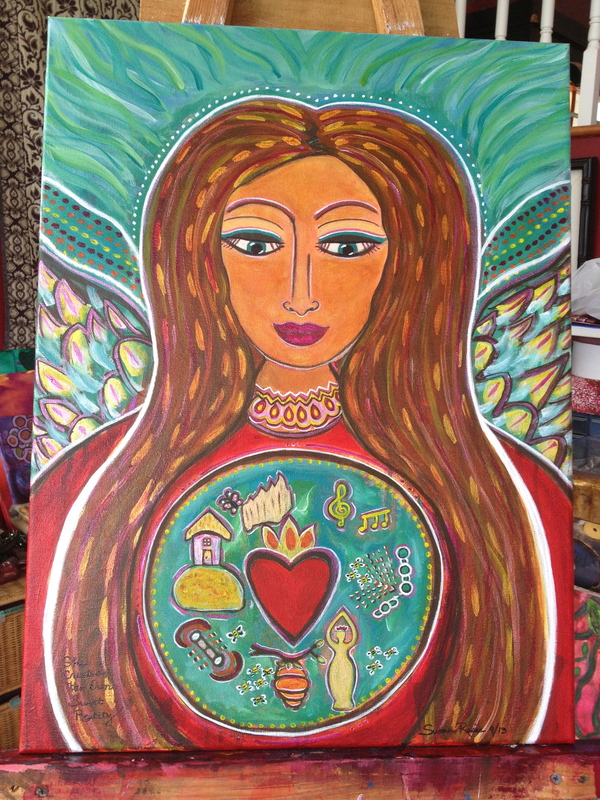 Susan’s artistic background includes studying, training & coaching with Shiloh Sophia McCloud (founder & CEO of http://www.cosmiccowgirls.com & creator of the 13 step Color of Woman Painting Process & Intentional Creativity.) 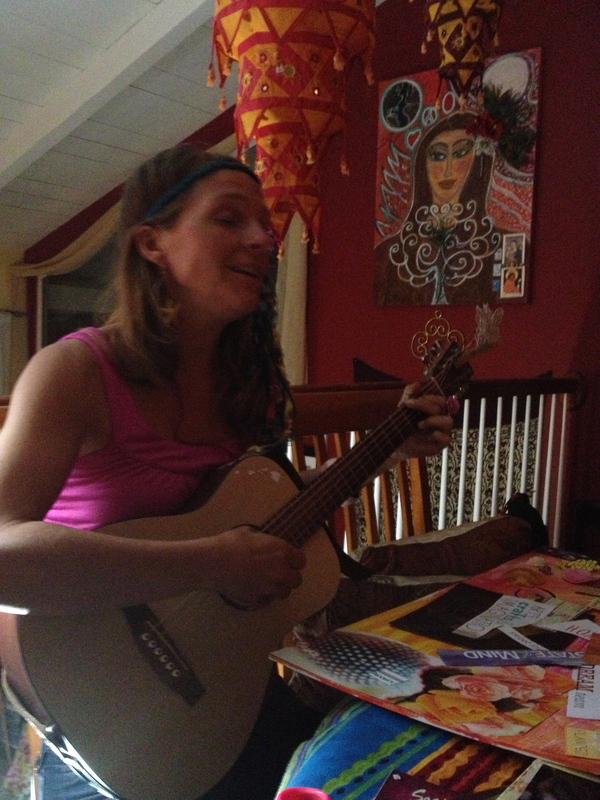 Susan is also a member/owner of Cosmic Cowgirls, a women & girl owned school of revolutionary education. She has also studied under master iconographer, Father Damian Higgins & Christine Valters Paintner, PhD of http://www.AbbeyoftheArts.com, to name a few. 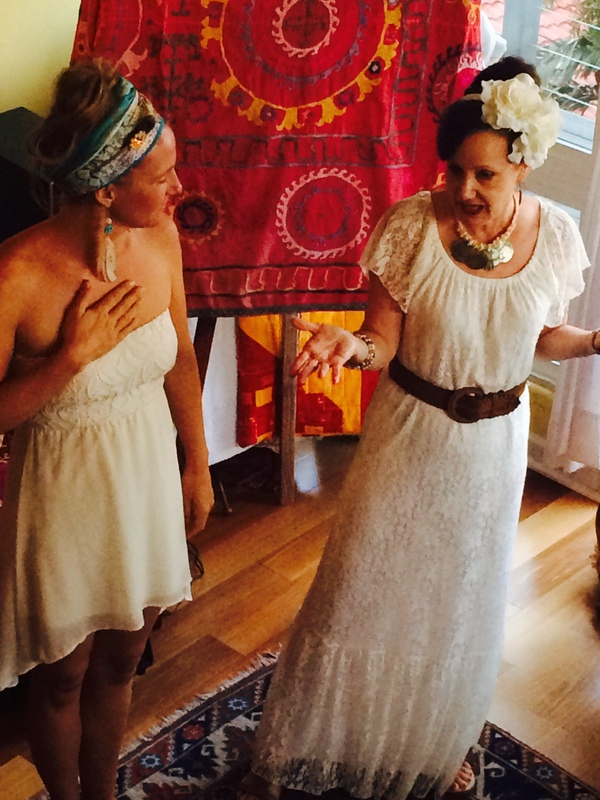 Susan is the founder of Glitter Gypsy Studio, http://www.glittergypsy.com & hosts workshops, art salons, private classes, pop-up dinner parties & more! Susan welcomes you warmly! Aloha ~ E komo mai! How was your summer? Mine has been busy, and full of creative adventures! 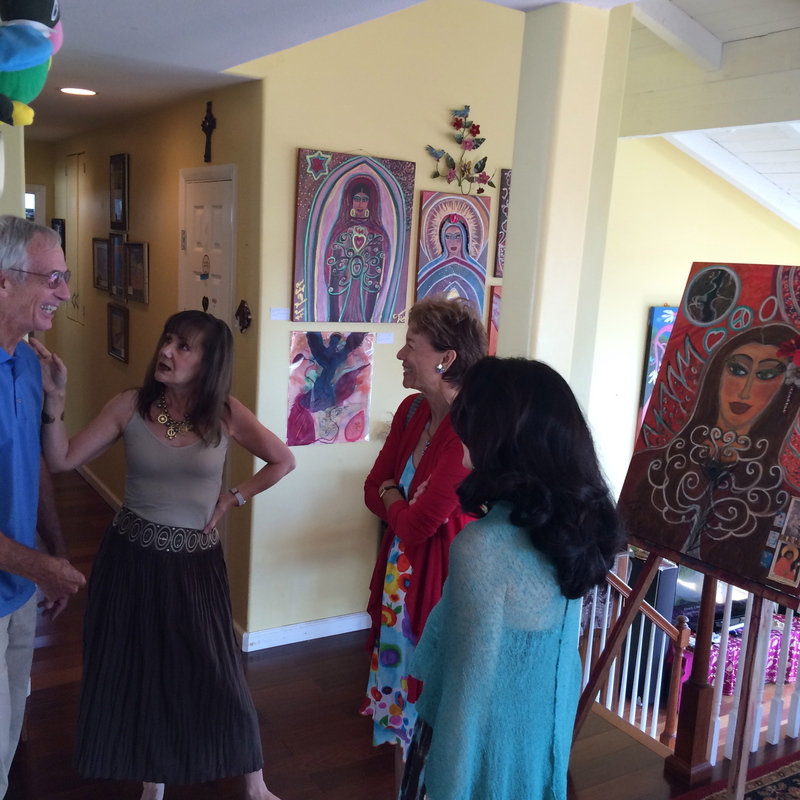 It began in June with the Champagne Art Salon that Lucie Lynch & I co-created, with the theme of “The Voice” emerging. Lucie is a sublime international singer & songwriter that I feel so fortunate to not only to call my friend, but a colleague as well. You’ve just got to check her out on Facebook or at http://www.lucieslighthouse.com. You’re going to love her & her mesmerizing voice & song writing. So the evening began with an Open Studio Art Salon, mingling & sharing my art with the beautiful group of people that joined us. 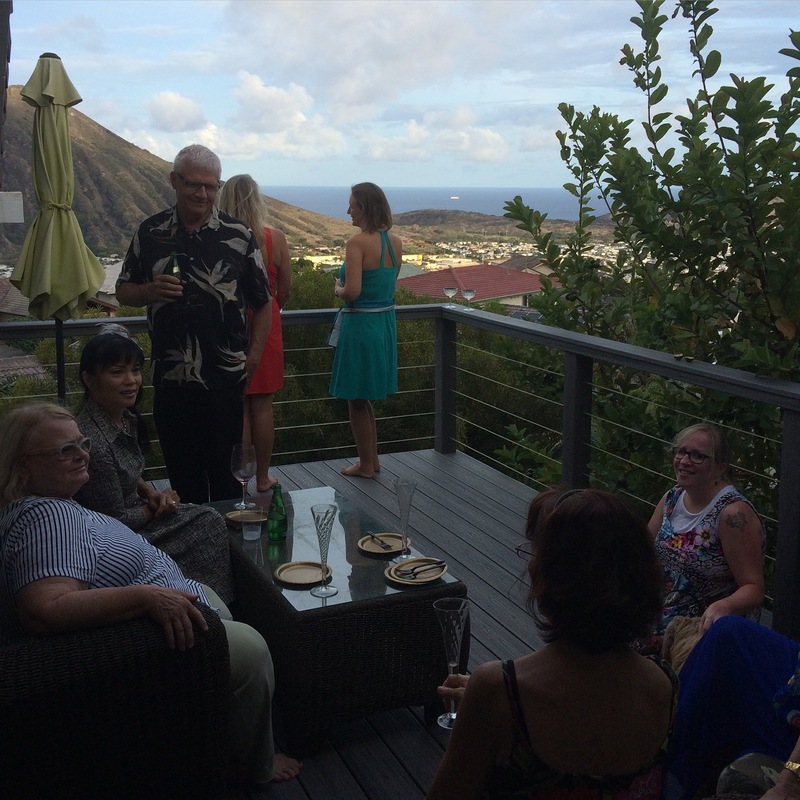 The champagne was flowing, delicious food was partaken & we all enjoyed the hypnotic views of Koko Head & the endless blue of the Pacific Ocean. What a treat it was! 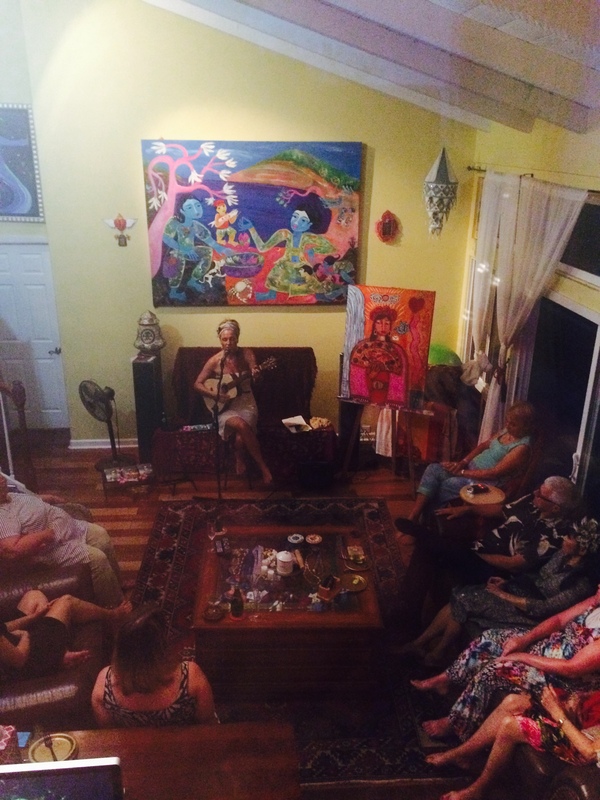 At 7:00pm, we gathered in our living room for an incredible living room concert with Lucie. 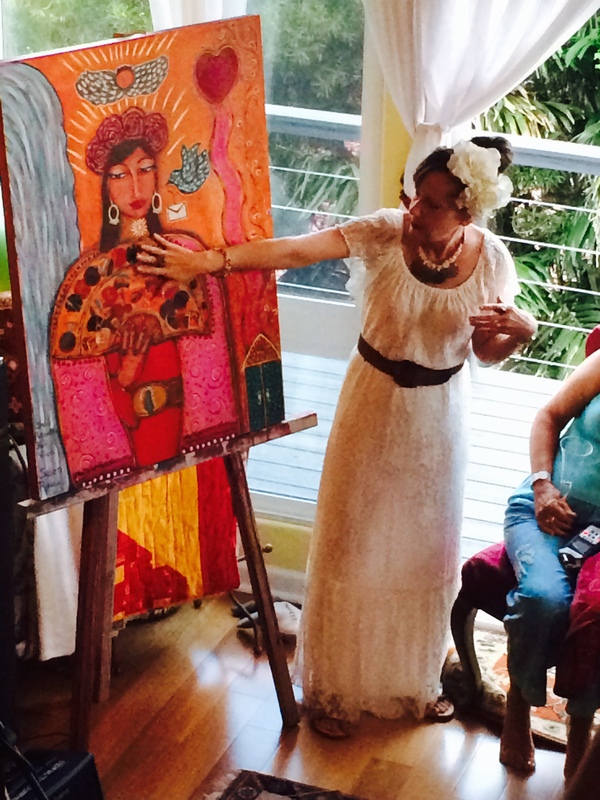 I unveiled my latest painting, “She Activates Her Voice” & shared my story of her creation with everyone. I explained how this painting literally manifested itself by my using a method known as “Intentional Creativity,” as taught to me by artist & mentor, Shiloh Sophia McCloud. This is a process in which one sets a particular INTENTION for the painting and then intuitively ALLOWS the painting to come into form. A give & take relationship develops between the painting & the artist. Lucie then began the concert by telling us her story about activating her own voice & continued to sing & tell us many more stories through her beautiful music. I am so grateful to everyone who attended, supported & had fun with us! I am humbly honored to have shared the stage with Lucie. I would also like to thank Leo & Marika Hura of LeoVidPro for filming the event. You can view the synopsis of the evening on their YouTube channel. And a huge shout out to my wonderful husband for helping out in whatever was needed. 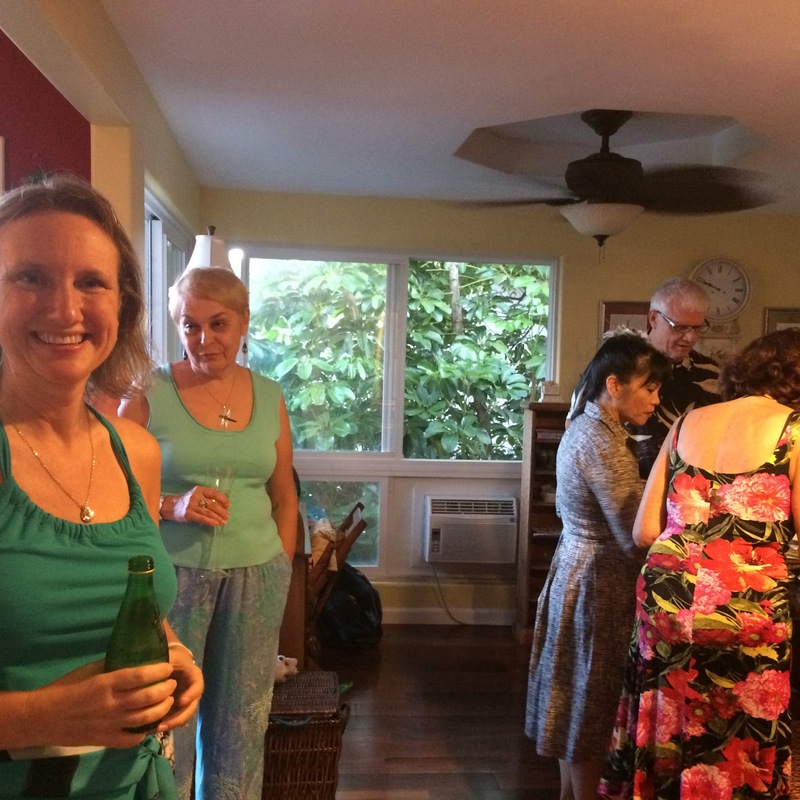 I definitely plan to do more events like this, so if this is the kind of thing you enjoy and you live or travel to Oahu, sign up to receive my newsletter. Better yet, friend me on Facebook, Susan Conrad Risse, or follow my Facebook Artist page at http://www.facebook.com/GlitterGypsy Instagram: @glittergypsies Twitter: @SusanRisse LinkedIn: Glitter Gypsy Risse ~ for much QUICKER updates. If you’re interested in corroborating in a creative adventure, please email me. I have a beautiful & inviting space & love to work with other artists & creatives. If you’re interested in art classes or private sessions, ART birthday parties, Ladies’ Night Out Art Parties or Joining me for my upcoming Womens Circles, please leave a comment or send me an email & I’d love to include you. 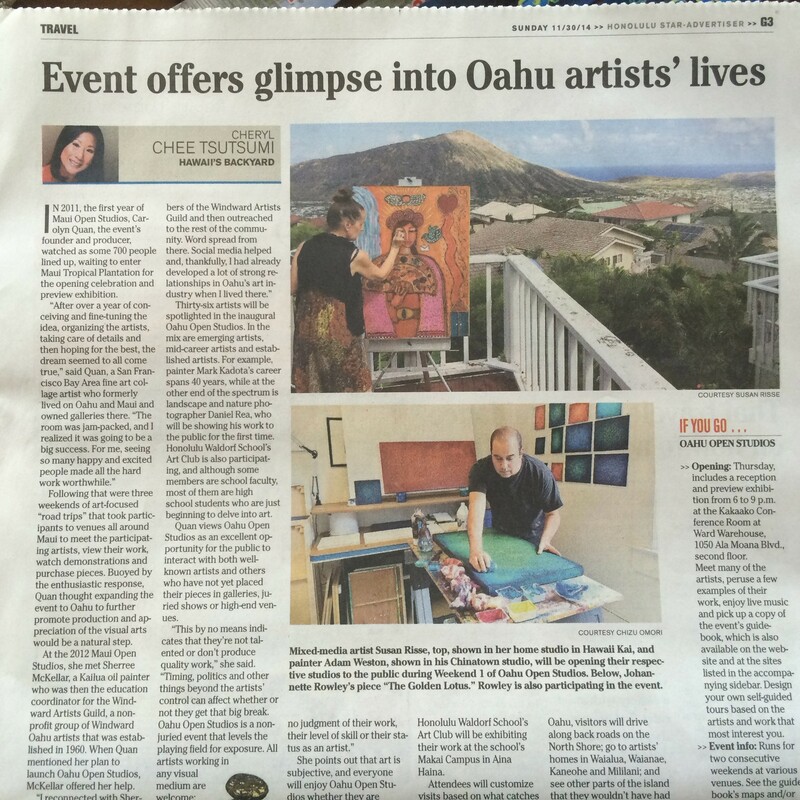 ***And please mark your CALENDARS for the second annual Oahu Open Studios! I’m so excited to be participating in this fantastic island-wide event, with more than 50 local artists on Oahu opening their studios to the public over 2 weekends this November 2015. We kick off the event on November 6th, from 6-9pm in the lobby of Bishop Place, 1132 Bishop St. for an Opening Celebration + Preview Exhibition during “First Friday,” a monthly Art event in Honolulu’s historic Chinatown district. The preview exhibition then continues & runs Monday-Friday 6:30am-6:30pm, November 9-20, 2015. The Artists open their studios the weekend of November 7 + 8 (Central, North Shore & Windward Oahu) & November 14 + 15 (from Mahaka to Hawaii Kai.) Hours run from 11am-6pm, both days per weekend. I am OPEN for WEEKEND 2, NOV 14 & 15, 11am-6pm, ARTIST #51 on the guidebook map. If you’d like your *free guidebook,* please let me know OR follow Oahu Open Studios on Facebook for guidebooks & timely updates. 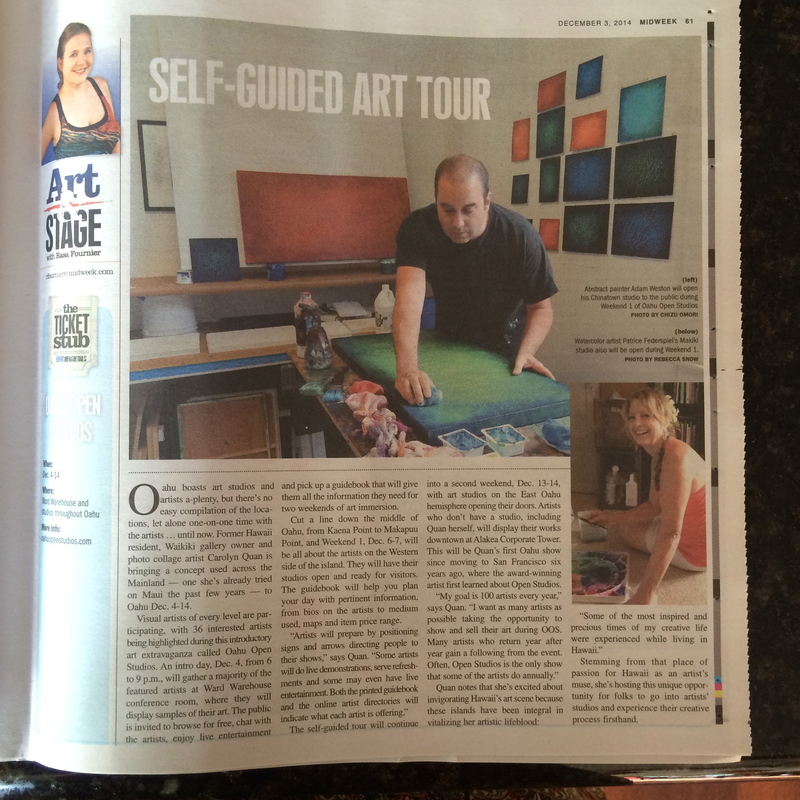 You may also view the event & print out your free studio tour map at http://www.oahuopenstudios.com. This is a great event for both art lovers & art collectors alike. Last year, I had a fantastic turn out & would love to see you HERE this year! Wine, tea & pupus will be served, so relax & stay a while. In additional to original art for sale, I’ll also have greeting cards & matted prints of various sizes (as well as custom orders) for sale to fit any price point. If you’ve wanted to see my art up close, please come visit! 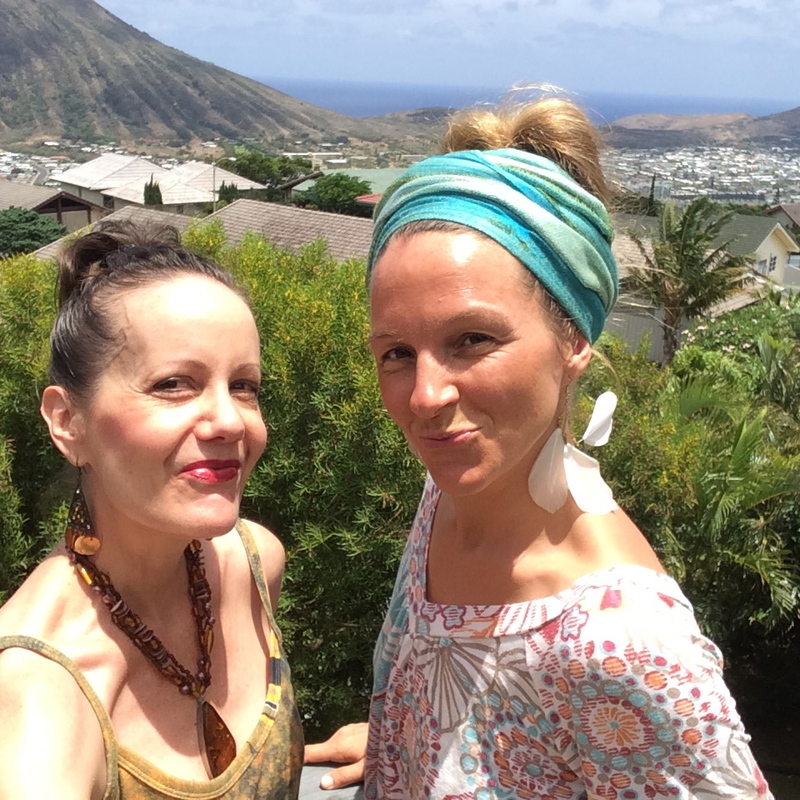 Glitter Gypsy Participates in Oahu Open Studios THIS WEEKEND- December 6th-7th, 2014! 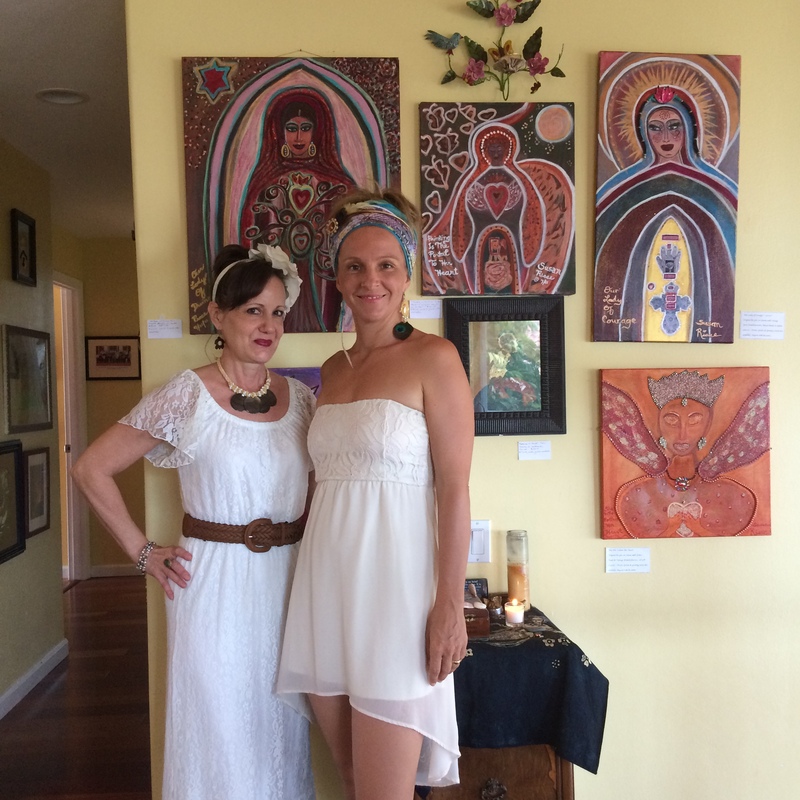 Please come join us here at Glitter Gypsy Studio this weekend, December 6th & 7th, 2014, 11am-6pm (both days) for ART, conversation & refreshments, in corroboration with Oahu Open Studios! Free guide maps & detailed information about this exciting event can be found at http://www.oahuopenstudios.com GLITTER GYPSY STUDIO (Susan Risse) is location #22 on the Guide map–Weekend 1 (12/6-12/7.) 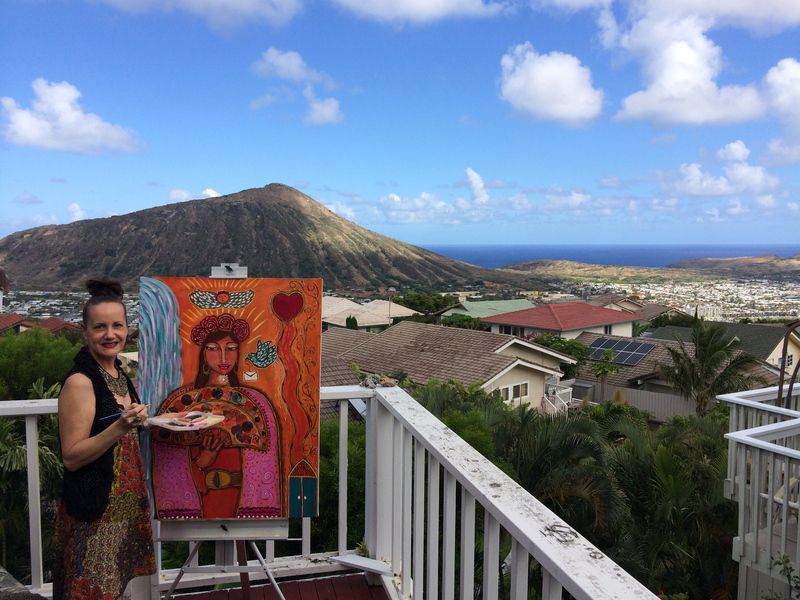 View Susan’s latest artwork, mix & mingle with fellow art lovers & collectors, purchase original gifts for the Holidays & enjoy a glass of wine while taking in the panoramic views of Koko Head & the gorgeous Pacific Ocean. Original art, giclees, matted prints, jewelry & functional pottery will be available for viewing &/or purchasing. Gift Certificates will also be available for easy shopping during this busy Holiday season. These may be used for merchandise, workshops, retreats, personalized art classes, ‘Ladies’ Night Out Parties,’ Customized birthday parties, Team-building events & more! Print your map & enjoy a fun, FREE weekend, while supporting your local community & artists. Art is the gift that keeps on giving. Peruse my “Artworks Pages” here on this site to check out my latest pieces. Drop your business card in the jar (or just your name & email on our paper slips) when you come by this weekend to be entered into the *FREE ARTWORK* drawing! **No purchase necessary nor need to be present to win. We will contact you if you’re the winner. We hope to see you here this weekend! I’ll see you HERE this weekend!!! Mahalo & aloha! Hi everybody! It’s been a very busy & adventurous year & I must admit– I’ve been very absent here! What I’ve found is that it’s much easier to follow me on Facebook at http://www.facebook.com/SusanConradRisse ~ OR ~ on my Artist Page at http://www.facebook.com/GlitterGypsy. I’m also on Twitter @SusanRisse, LinkedIn( Glitter Gypsy Risse) & am now getting started over on Instagram at glittergypsies. You can also check out my “OMG’s” (One Minute of Glitter) on my YouTube channel gypsyinparadise. I’m posting on Facebook nearly every day, so I really do hope that you will come on over to one or better yet (for me, anyway) ALL of these windows of my world & “friend, follow or like” me! I SO appreciate your following me here & really hope that I’ll see you over there now too! I’m also COMPLETELY REVAMPING my website (this one) http://www.glittergypsy.com to a beautiful, updated visual feast that will include all of my new artwork, offerings AND an on-line store, where you’ll be able to view & purchase my original art, giclees, prints, jewelry & more all in one place! There will also be workshops & other class offerings (on-line & in-person) & other projects that I’ve been working on all year for your perusal. I’m super-excited to be working on this & can’t wait to open it! It is, however, a huge undertaking, so I’m not exactly sure when I’ll be launching it, but I’ll announce it here, as well as over on my other social media sites. Again, thank you so much for following me here. I’m not going anywhere, but I just wanted to offer you some additional options as to where you can follow me. I really hope that you will. I’d like to leave you with a quote from Rumi, as well as my latest painting, which is still drying on the easel.